(Table 2). A gibberellic acid spray, the easiest of these options, is ineffective on many varieties. Brushing can reliably reduce cluster compactness, but this is a labor-intensive practice, and the grower must decide if it is warranted. It may be a great technique on a few vines in a backyard vineyard, but will it pay for itself on commercial acreage? 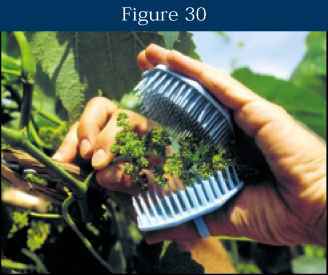 Brushing must be performed prior to the start of bloom — i.e., before the caps come off of the individual florets — to avoid mechanical scarring of berry surfaces. A cluster is held in one hand (Fig. 30) and one or a pair of brushes with coarse plastic teeth are stroked through it several times. A common hairbrush with relatively thick, widely spaced plastic bristles may be used. 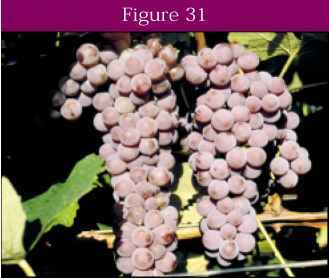 Canadice, a red seedless table grape for temperate climates, has several desirable characteristics (Zabadal et al., 1997), but it often develops excessively compact clusters that cannot be loosened with gibberellic acid. Brushing Canadice clusters at the Southwest Michigan Research and Extension Center reduced cluster compactness and increased berry size (Fig. 31). 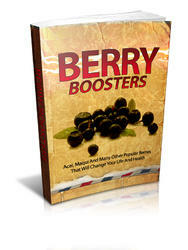 A very high percentage of the florets retained on the cluster after brushing will set grape berries so be aggressive when brushing — remove 50% or more of the florets. Fig. 30 - Two plastic bristle hairbrushes that are about to be used to remove the majority of florets on this cluster. Experience will indicate the extent of brushing necessary for a particular variety. It is amazing how a cluster may look very straggly after brushing (Fig. 32) and yet still set a full cluster (Fig. 31). Fig. 31 - Clusters of the 'Canadice' variety that were either brushed (r) or not (l) at early bloom. 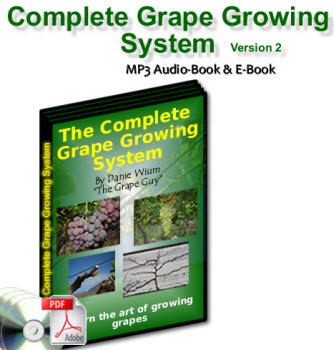 How to grow table grape?